Napoleonics, Wars of the Revolution, Renaissance cavalry, Macedonians or Thebans. Whether it is ships, horses or men there is a possibility to arrange them in columns or lines. The advantage with a column is that it focusses effort at a specific point and also that it is an easier formation for manoeuvre. It is just follow my leader. The column must be led as a whole, however, or the tail can decide to depart while the head takes the strain. The line, however produces a distributed application of force along a front which the enemy must withstand at all points or be engulfed. On the other hand, the elements of the line should be marshalled carefully to maintain a common front or else the formation goes to pieces. A column will always have a percentage of forces unable to act against the enemy because they have friends in the way, whereas a line uses all its strength so long as they come up against enemies. 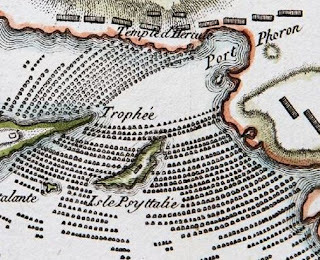 Salamis is the Mastadon of ancient sea battles in the age of the trieres. So many ships packed into a small space. A space that funnels the opponents into each other and hinders their escape. The battle that was a long slogging match with a tangled mess of ships fighting a struggle of attrition. Recived wisdom is that the narrow straits limited the scope for tactics on each side and two masses of ships, the total number of vessels cited by ancient sources must be involved, smashed into each other. The most obvious constraint on the battle is the width of the strait. 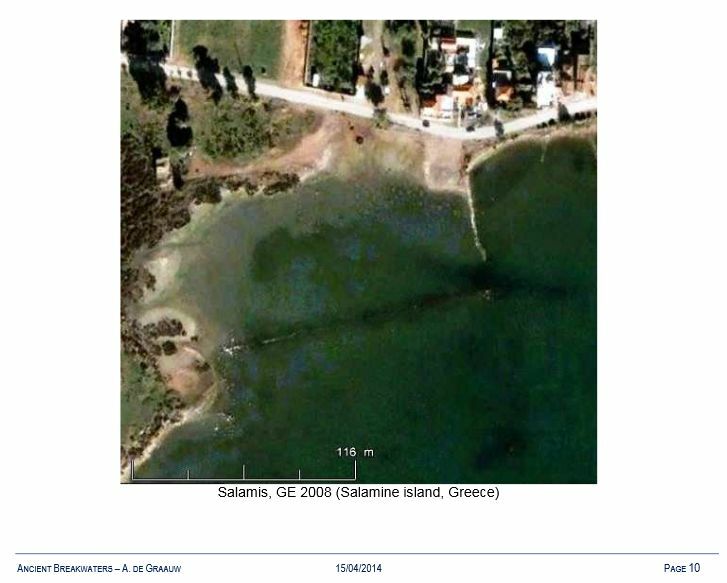 At various points the width from mainland to Salamis is circa 1500 metres. Further up the strait it is split around the island St Georgios and the smaller rocks off the Perama shore. It is easy to fall into the trap of allotting ships to this distance, dividing this number into the total for each side and thus achieve a calculated number of ranks. Calculated from ancient data ... must be true...? Æschylus and Herodotos both imply the Persians made an offensive move against the Greeks. 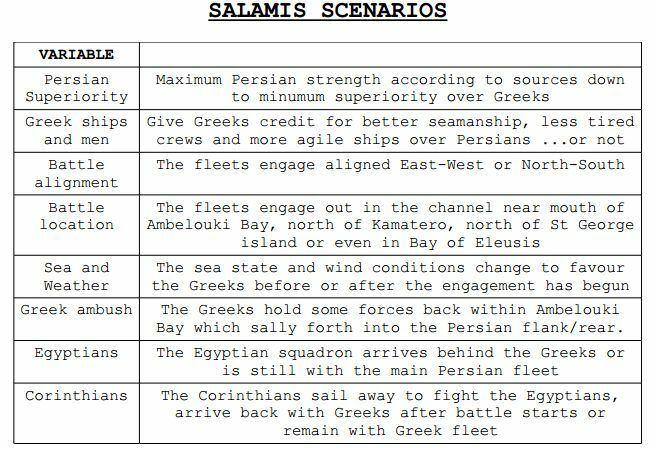 In any case, the Persian fleet moves from 'between Ceos and Mynichia' to a place inside the strait where the battle took place. The Greeks had to assemble their battle line before the Persians arrived. 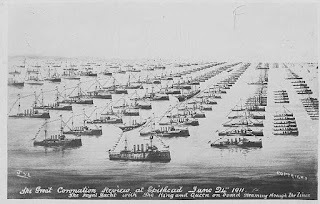 They had to launch beached ships and take up anchors and form in their units. They then may have backed water for a while before contact was made. There is thus no discussion that both fleets moved around a bit. The Persians advanced at least 2 and up tp 4 kilometres - mostly in dark, half-light or mist. The Greeks had to assemble their forces from being beached, advance up tp 3 kilometres and back maybe 1 kilometre before fighting. The obvious question is, 'column or line?'. 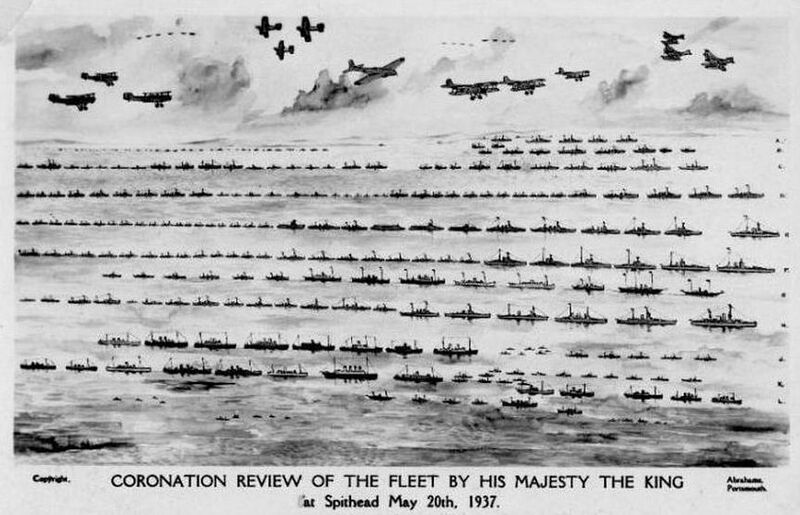 After the above calculation, lines dominate consideration of the battle but if 1600 galleys are to move about in concert are lines a practicable proposition ? Add to this, the fact that the Persians are moving in the dark or half-light !!!! How on earth could a line be kept in such circumstances ? The Persians patrolled the entrances to the strait all night - this can not have been in lines. If they tried to maintain station it would be a disaster. They must have rowed - probably at a minimum rate - in columns - probably following a lantern on the stern of the previous ship, to and fro. 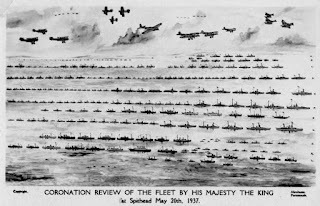 My point is that a line of many ships - galleys - needs control to be maintained as any kind of regular formation. 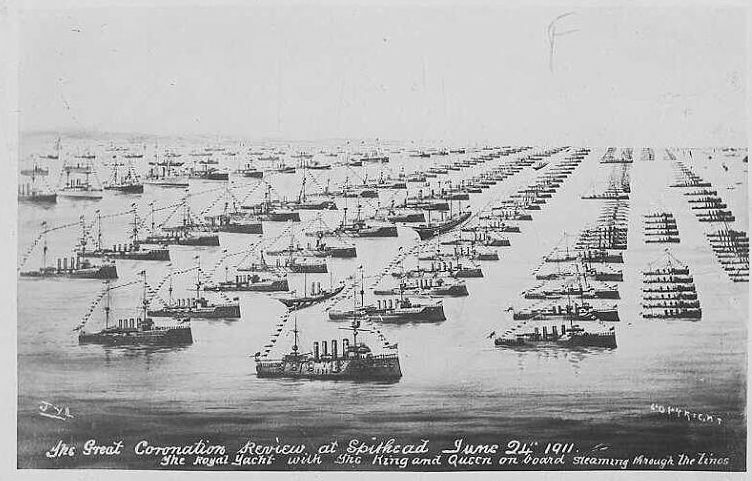 Progressing at speed, across disturbed water or around obstacles, or in the dark will lead to a disintegration of the formation ergo the Persian ships were in columns at least as they approached the scene of battle. 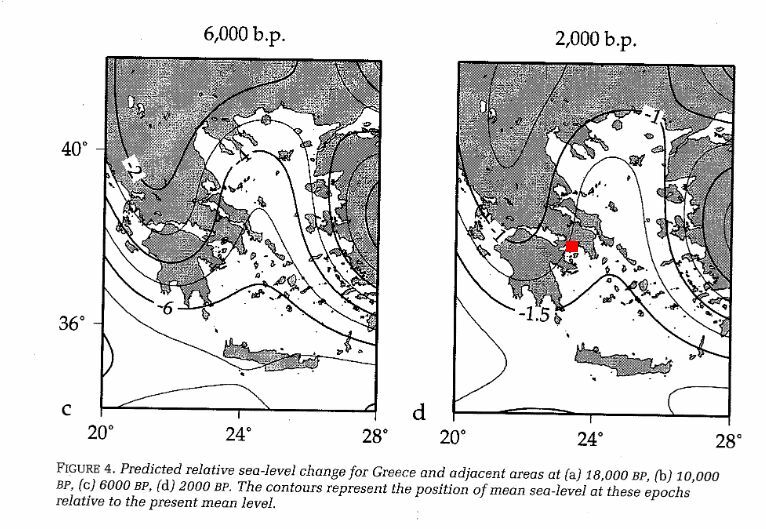 Looking at a lot of accounts of Salamis one is struck by the variability of the topography. Barry Strauss is not alone in playing fast and loose with the Earth's surface. I present the fabulous shape-shifting Isle of Psyttaleia as featured in 'Salamis' by Barry Straus. Who has a doctorate in a subjective discipline one assumes. 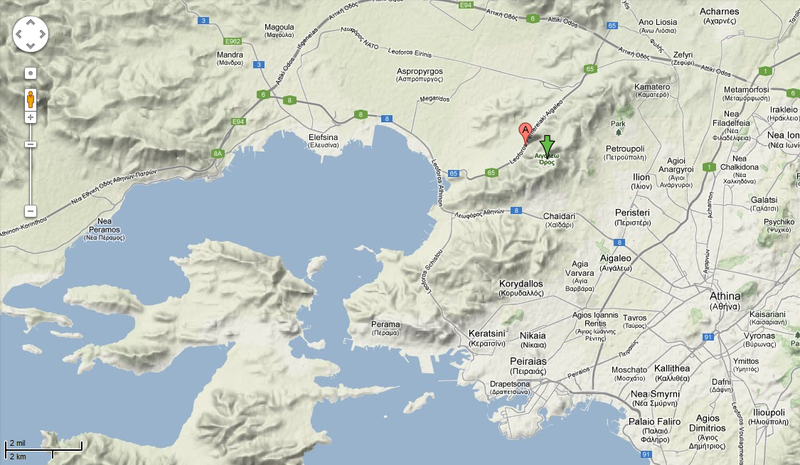 Easier said than done to get a good map of Salamis battle area. How reliable is this re. 480BC ? 1) Sea level changes. 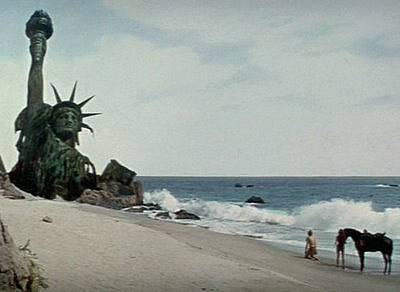 Oft-quoted figure is a relative sea-level rise of 1 fathom since 'antiquity'. As a geologist I am aware this is a debateable figure. Greece is a tectonically active part of the world which means we have to add rising or sinking land-masses. 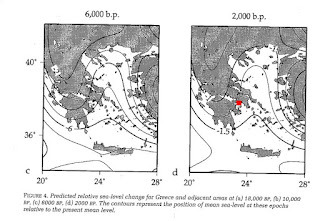 The site of the battle of Marathon, for example, should by rights, be flooded by now according to the eustatic sea-level change curve ( a kind of base-line for world sea-level changes). BUT because the land has been pushed up at about the same rate then the coastal situation remains similar to what it was 2500 years ago...REF. This means we can never know the exact coastline from 480BC but we must try to get an idea..
Did the sea come up or the land go down ? 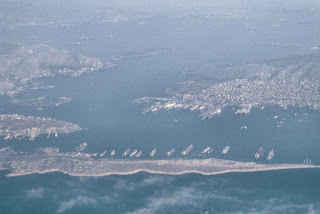 2) Human activity in this area where the Greek navy has its main base, there has been unbridled summer-house development and where the recently greatest maritime nation has its main port is unbelievable. One island - Psyttaleia - has become Europe's largest sewage treatment plant and the mainland coastline is obscured by reclaimed ground. One thing that can be said is that the sea-level change is not catastrophic. 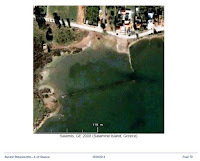 A breakwater from antiquity by the ancient Salamis port in Amboulaki bay is still visible in the water rather than high and dry or a long way off the shore-line. Just to be cruel, the gods have given us a different alphabet from the Greeks so simple web searches also become more problematic. 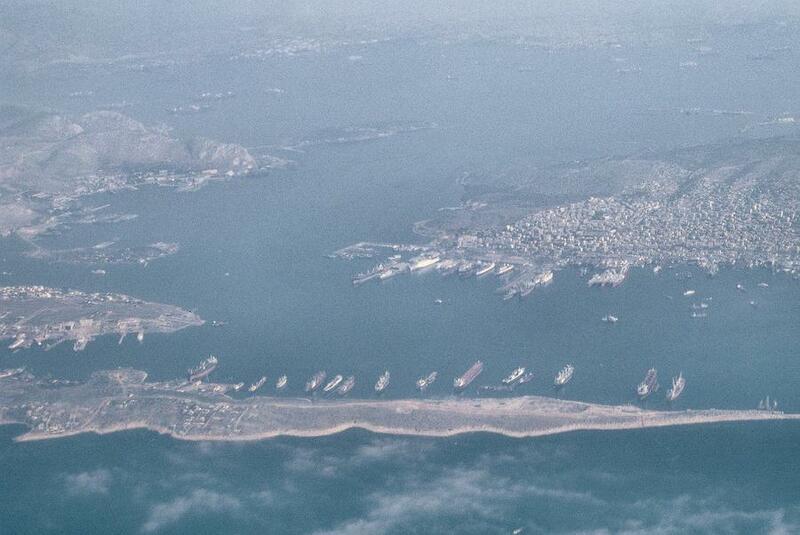 Kinosura peninsula complete with deep-water mooring for giant ships and Perama port installation in background. The solution so far is to use eighteenth century French maps ! 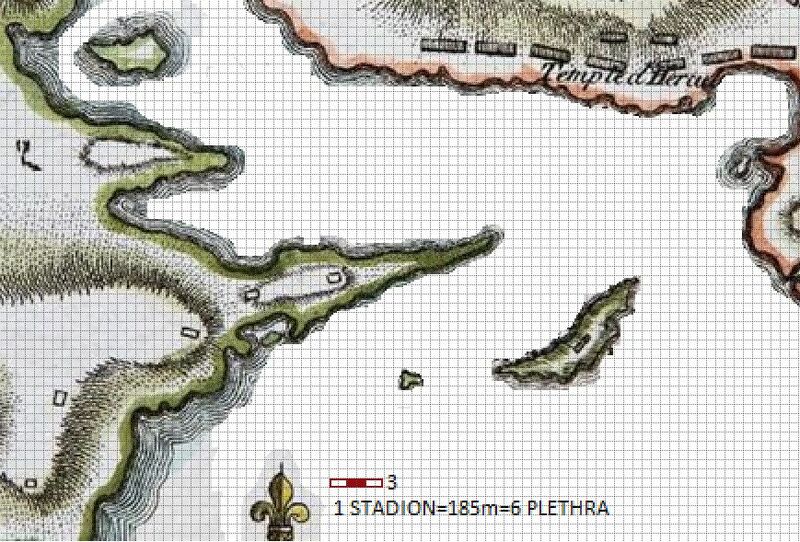 These seem to be a good match with sattelite maps and fotos and the engineering tecnicians who supported French fortification science seem to have done a good job with naval charts from the time. Barbier du Bocage's map of 1785 gives a nice base map. Notice the north-pointer is the Fleur de Lys..the map was drawn just a few years before Le Revolution. Until things obviously awry I will use this base map plus modern depth information. 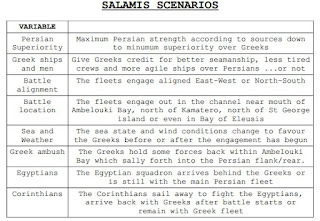 Condensing the possibilities these are the main variants for Salamis. Next step is to work out which ones give the most enjoyable fights!